The TCLab is a hands-on application of machine learning and advanced temperature control with two heaters and two temperature sensors. The labs reinforce principles of model development, estimation, and advanced control methods. This is the fifth exercise and it involves estimating parameters in a multi-variate energy balance model with added empirical elements. The predictions are aligned to the measured values through an optimizer that adjusts the parameters to minimize a sum of squared error or sum of absolute values objective. This lab builds upon the TCLab C by using the estimation of parameters in an energy balance but also adding additional equations that give a 2nd order response. 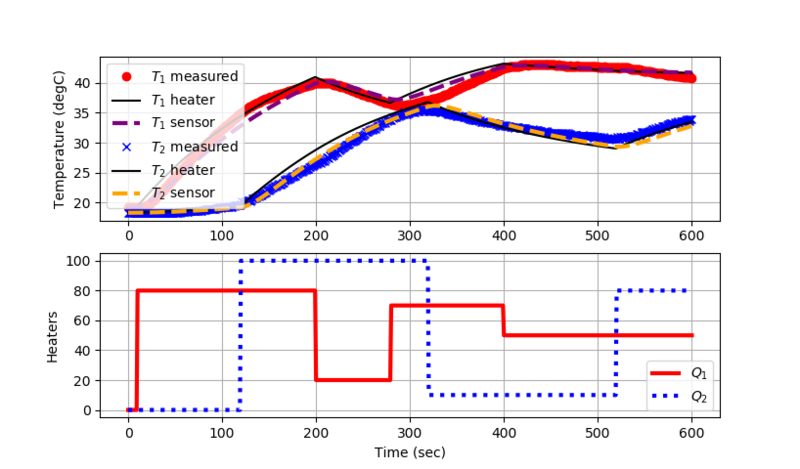 The 2nd order response comes from splitting the finite element model of the heaters and temperature sensors. This creates a total of 4 differential equations with parameters that are adjusted to minimize the difference between the predicted and measured temperatures.